Separating large aloe plants into several smaller ones is a wonderful way to propagate new plants to share with friends and family or to use in other projects. It’s also a great way to save money. The large Gold Tooth Aloe Laura from Garden Answer divides in this video cost $22 and produced over 20 new plants. Aloes are desert plants that are hardy in zones 9-11, or to about 20 degrees Fahrenheit. In cooler regions they may be grown in containers and brought indoors for the winter. Aloe is a clump-forming plant meaning they naturally produce many baby plants called offsets. Mature plants flower in late spring and early summer with bright orange-red blossoms that attract pollinators. It is always best to use fresh soil when repotting since the nutrients in the nursery potting soil are likely used up. 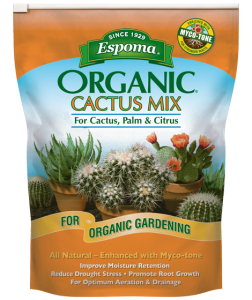 All succulents and cacti need a free-draining, organic, potting soil like Espoma’s Cactus Mix. Roots will rot in wet soil. The main plant will still have plenty of roots and can be repotted. Wait to water it for about a week to allow the leaf scars to callous over. This helps to prevent disease and infections. The offsets all have open wounds where they were broken off from the main plant. The wounds need several days to dry and callus over. One method involves letting them dry on a table in bright, but indirect sunlight for 5-7 days before planting. They may also be planted right away but not watered in for a week. Aloe prefers full sun to light shade. These plants are drought-resistant but container plants benefit from some extra water during the hottest days of summer. Feed regularly with an organic fertilizer like Espoma’s Cactus! Always follow the package directions. Check out these blogs for more information about growing succulents and the secrets to their care. Dressing up window boxes can add so much beauty and curb appeal to your home. They instantly greet you the moment you walk up to your home, brightening every day. If you don’t have window boxes, just put a good sized container next to your front door and make the same combination in a smaller form. 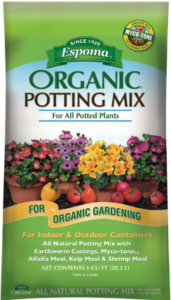 If you have old soil in your window boxes, it’s best to remove it and start with fresh Organic Potting Soil from Espoma. In this case, Laura is only replacing half the soil because it was only used briefly in her window boxes last fall. Pour the new soil in until your planters are half full. For these early spring window boxes and containers, you can take liberties with spacing and sun and shade preferences. The plants won’t actually grow much in cool climates, except for the daffodils. As you will see this combination contains both sun and shade-loving plants. This gorgeous combination begins with Lenten rose, Helleborus ‘Ivory Prince’. Their burgundy pink buds open to ivory with a pink blush on the back of the petals. These are the tallest plants in the combination and are planted in the back. Next, plant Martin’s spurge, Euphorbia ‘Tiny Tim’. The emerging foliage is deep red and picks up the reddish tones in the Lenten roses. A miniature Narcissus called ‘Tete-a-Tete’ is placed in between the spurge and will add a bright pop of yellow when they flower. Two varieties of pinkish apricot primrose are planted next and are interspersed with deep blue perennial violets. This design is awfully clever for a couple of reasons. First of all, it shows that it’s possible to create a sophisticated early spring display that can withstand very low temperatures. Secondly, it’s extremely economical. All of the plants in her palette, with the exception of the primrose, are perennial and will be planted out in her landscape in late spring. Having your plants do double duty is brilliant and saves money. Since beauty is in the eye of the beholder, get creative and try out different combinations or add branches for another design element. Have fun. Social media is blowing up with a new trend – the Succulent Pot in a Pot. It is a fun way to make a succulent arrangement that is a little out of the norm. Basically, it is creating a potted succulent “floral” arrangement inside another pot. You use a small container for the base of your arrangement and place it on its side in the larger container. You fill in the area above the small pot with succulents so, when you look down into the larger pot, you’ll see a beautiful “floral” arrangement made out of succulents. It might seem a bit complicated in the explanation, but this project is simple, fun and adorable to look at all year long. Grab a container that has proper drainage as succulents don’t like to be in too much water. Use an aerating soil, like Espoma’s Organic Cactus Mix to fill your container one inch from the brim. This will allow room for you to sink in the smaller container and plant your succulents. Gently sink your smaller container into the soil. You want the bottom half of it to be buried, so the finished product will look right. Starting towards the opening of the smaller pot, place your succulents the same way you would make an upright arrangement. Get creative with the plant use and layout. Go with contrasting colors or various shades of the same. Laura wanted this to be an ode to Valentine’s Day and went with shades of pinks, yellows and light greens. *Expert Tip: Dress up your soil with pebbles, mulch or even miniature succulents to disguise the soil and give it a more polished look. Take care of this arrangement the same way you would any other arrangement. If you used any cuttings, give it a week to allow them to heal before watering it in. When watering try to avoid watering the tops of the succulents – get as close to the soil as possible. Be mindful that in the winter, you may only need to water it every 10 to 14 days. While in the summer, you will be watering it once a week. Find the extended version here. Succulents love the sun and thrive when grown in proper light conditions. But you’ve probably seen or grown a succulent that gets leggy and stretched out. These leggy – or etiolated – succulents aren’t getting the light they should in the space you have it. This phenomenon happens with all indoor plants, not just succulents. You may notice how your plant bends toward the sunlight, stretching to get as close as it can. Succulents continue to grow taller as they stretch toward the sun, leaving more space between each leaf. While etiolated succulents won’t go back to their prior compact shape, you can give them a haircut and propagate the cuttings to get even more succulents. In this video, Laura from Garden Answer shows you how to deconstruct the plant and start propagating to try again. Remove leaves. Use pruners or snap off roots and healthy leaves from the bottom half of the succulent. Get as clean of a break as possible to encourage new growth. If your leaf tears, get rid of it. Remove leaves until you’re a little more than half way to the top. See step three to learn how you can snip and replant the stem and the remaining rosette at the top. Let leaves dry. Allow leaves to dry for a few days after removal, until the raw ends have calloused. Repot the stem. Planting the stem deeper, where the leaves were removed, will allow to grow new roots. If your stem is too long for your pot, simply trim it 1-2 inches from the base of the plant. If you have no stem at all, it’s ok. Just nest the rosette in the soil so it doesn’t fall out. Get ready to grow. Place dried leaves on top of a tray, saucer or container filled with Espoma’s Organic Cactus mix. Do not bury leaves in the soil. Place the container in a spot where it will be protected from full sun exposure. Spray soil until it’s moist, without being drenched. Water again when soil is dry to the touch. Replant. Once your propagated succulents have taken root, they can be replanted. Show them off in a repurposed planter. Lastly, be sure to check the roots every six months to see if you need to move your plants to a bigger pot. Feed your succulents regularly with Espoma’s Cactus! liquid plant food for best results. Showcasing poinsettias at Christmas time has long been an American tradition, even though the plants are native to Mexico. What we think of as the large petaled, red flowers are actually modified leaves called bracts. The true flowers are the tiny ones in the middle. Today they come in a wide array of colors from shades of red, orange, pink, yellow and white. Some varieties even have cream and green variegated leaves. When you shop for a poinsettia plant, make sure they aren’t situated too close to the door of the store, where they are repeatedly exposed to warm and cold air. Cold temperatures can easily harm these tropical plants. Check the foliage to see that it looks healthy and the inner bracts are a solid color, not showing any green. That would mean that they are nearly finished flowering. Lastly, before leaving the store make sure it’s in a sleeve or put another bag over the top of it so that it won’t freeze on the way to the car. As you can imagine, these tropical plants like lots of sunshine. Put them in your brightest window but not touching the glass, as it can be quite cold. Keep them away from drafts both warm and cold. Water your poinsettia when the soil feels dry on the surface. Check the soil regularly, as the indoor air can be warm and dry in the winter. Natives of a humid climate, they will definitely appreciate being misted now and then. Like most house plants, they don’t like to be in standing water. Check to see if the foil liner allows water to drain freely and cut it open if not. Poinsettias are known for being toxic to pets and humans. However, in reality you would have to ingest a very, large amount to become ill. The white sap can be a skin irritant. Wash your hand well if you get any sap on them. It’s always best to set them up high away from kids and pets and that’s probably where you’d put them anyway so, they don’t get knocked over. One last thought, think of your poinsettia as an annual plant and plan on buying a new one next year. It’s a tricky business to get them to bloom again that involves a strict light and dark regime. Even very short periods of light at night for instance, from a street lamp can prevent them from blooming. Can’t get enough holiday plants? Check out this video on caring for your Christmas Cactus.